Refresh your home and make it up-to-date with a remodel. Whether you’re tearing it all up for a clean slate or reworking a favorite room for a fresh look, these are the latest trends to keep in mind when designing your dream home. Don’t settle for a one-size-fits-all solution. Let your personality shine through and throw outdated rules out the window. Who says your ceiling can’t be patterned or that you can’t paint a small room black? This year is all about embracing your style and needs for a home that’s fashionable and functional. This refreshing state of mind applies to your appliances as well. 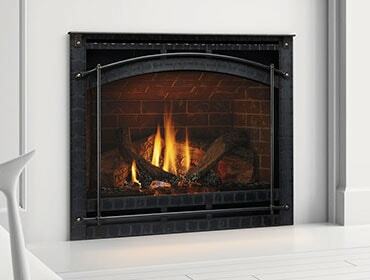 Even the Crave Series Gas Fireplace allows you to define your design with four sizes and multiple options for a look that’s all your own. Following this theme of breaking free from previous constraints is the idea of the outdoor living space. Extend your home past its four walls and into nature. You can create a seamless transition between the two with an indoor/outdoor fireplace. See-through glass gives you the best of both worlds, offering the ambiance and warmth of flames to your interiors and patio at once. Shiny, reflective and gilded metallic pieces are out. The natural inspirations of matte metals and wood elements have taken over as a top interior design trend. Metals have gone from being merely an accent to focal pieces for rooms. Pair metals with different types of woods for a look that effortlessly blends together and adds visually intriguing textures. The key is to not to be perfect. Have fun mixing and matching woods of different grains and colors. In 2015, you’ll find homeowners making the most of every last nook and cranny of the house. Use those precious square feet to create mini-escapes. Transform the dark and dreary into something light, bright and comfortable. It’s a great way to remodel without going through the efforts and costs of an addition. Not to mention when you sell, you’ll more than likely be reaping the rewards of this added value. Is your home in need of a quick and easy update, rather than a full-on remodel? Learn How the Right Colors Can Transform Your Home.